Recently, I mentioned that I had A LOT of Red Beans and Rice leftover and I really wanted to make sure I used them since they were so delicious. An obvious option was to make a Cajun Pork Tenderloin (I will share that recipe another time) and my favorite side dish…Braised Greens! Now, I make my traditional greens with a nice big ham hock but when I want something a little different, this is my go-to recipe and I love it! Greens have been a staple in my family my whole life. They are always on the table at Thanksgiving and I make some kind of version often. This recipe is one of my favorites and it is so easy! Many times I double it because I like to add the leftovers to my vegetable soup recipe. The tangy flavor of the greens is so refreshing and brightens up any dish! Cook the bacon over medium heat in a large skillet until browned, about 6 minutes. Remove, chop, and add back to the pan…Do not drain the grease! Add the onion, garlic, oregano, salt and pepper flakes and cook until tender, about 8 minutes. Stir in the greens and 1 1/2 cups broth, cover, cook until wilted, about 10 minutes. Stir in 1/4 cup broth, vinegar, and tomatoes and simmer for at least an hour. Season with salt and pepper to taste if needed. 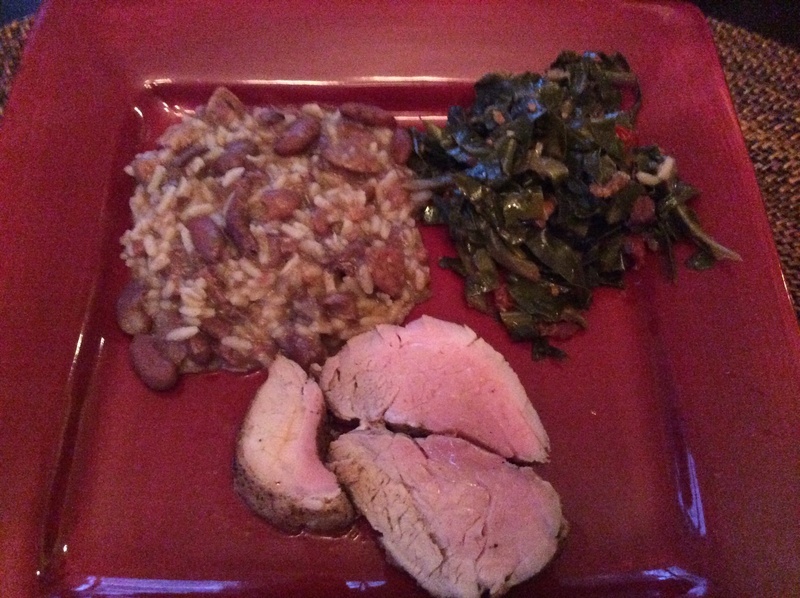 My Braised Greens served along with leftover Red Beans & Rice and Cajun Pork Tenderloin…Yummy! Bottom Line: The perfect mouthful and I’m not even kidding!